We are a local family business and have been specializing in block paving, patios, driveways, bricklaying and brickwork in the Toombridge, Antrim area for over 10 years. 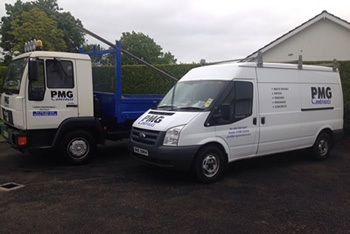 With an enviable and long established reputation within the local area with PMG Contracts you will know that you can be confident that we will deliver what we promise. Our reputation is built upon top paving products and high quality Block Paving laying services that lead the market in design, innovation and performance. Following a rigorous selection procedure, we have been included the "best pavers in your area" by A&G Approved Layer. Following a rigorous selection procedure, they have included the best pavers in your area in the A&G Approved Layer list. Judged on their technical and creative abilities, only a select few have made the grade, so you can be sure when you choose Acheson & Glover, you are always getting the very best. All our work carries a ten year guarantee and we are approved Acheson & Glover Layers which means that you are reassured that you can trust us to carry out your work correctly and choosing PMG Contracts is the right decision and is risk free for you. Our reputation is built upon top paving products and high quality Block Paving laying services that lead the market in design, innovation and performance. All of our paving products are carefully selected, supplied by Acheson & Glover and designed to ensure meticulous attention to detail to provide you with the confidence that you have made the right choice in years to come. As we are independant we can source brick paving, flags from any of the top suppliers.